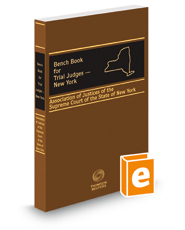 Home > Law Books > Dictionaries/Desk Reference > Bench Book for Trial Judges—New York, 2015-2016 ed. Bench Book for Trial Judges – New York is a comprehensive guide to court proceedings for New York trial judges. New judges receive a copy of this publication to help them preside with consistency and authority and, with this title, attorneys better understand and anticipate judges' actions under various circumstances. This title includes numerous sample documents, ready-reference tools, and citations to pertinent cases, statutes, and rules.